Partsam offers an extensive line of high quality marker lights for car, truck, trailer, boat, bus, lorry, van, caravan, camper, RV, etc. You can find all the marker lights you need in Partsam! 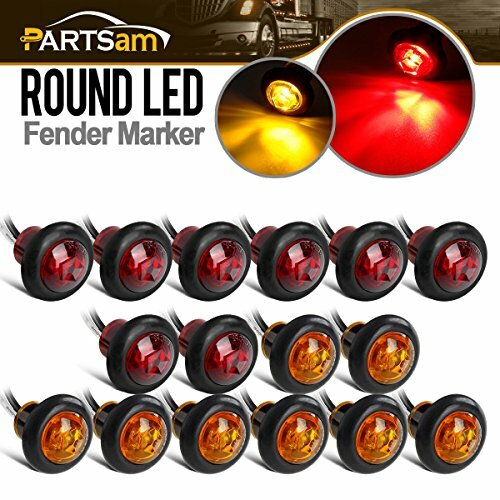 Partsam 8Red 8Amber Miniature Round Truck Trailer Clearance Marker Lights. Includes standard 2 Pin plug and attached grommet. Partsam ( 8Red + 8Amber) Miniature Round side markers light clearance lights with PLUG, different from others from the market. Universal for any 12V Vehicles, For Pickup, trucks, trailers, horse trailer, flat trailer, travel trailer, boat, Lorry, Van, caravan, camper, RV etc. Each side marker has one single led. Two wires and rubber Grommet are included and very easy to install. If you have any questions about this product by Partsam, contact us by completing and submitting the form below. If you are looking for a specif part number, please include it with your message.